This article has already been distributed in pamphlet form, the few paragraphs immediately below are a few notes on recent developments. In light of the state's new attack of SB 1070 on migrant communities, OSABC would like to show a perspective and experience that is often overlooked in the immigration struggle, that being the indigenous impacts. Indigenous communities have, and still are being attack by the state (meaning the political entity, also called "government") since the first migrants, European settlers, arrived to this hemisphere. But that, we already know. What OSABC would like to express is, WE ARE STILL HERE. As O'odham, we have seen our lands occupied by three colonial states (Spain, Mexico, and now the United States), and STILL, we have endured in the face of colonization. The very land that this bill was passed on, is still O'odham land! From the Phoenix Valley, to Scukson (Tucson is from an O'odham word), to Rocky Point, to the Sierra Madres in Mexico, this is O'odham jewed. The passing of SB1070 leads us to the police state, and does not just affect migrants, it affects us all! SB 1070 like policies already occur on the Tohono O'odham Nation since the mid-90's with the states push for immigration enforcement. Border Enforcement that would be a Berlin-like Wall through our lands to control movement. The current push for immigration reform by politicians and by reformist activists includes the push to secure “their” borders which would be the forced removal and relocations of all indigenous tribes that live in the border region (Yaqui, Lipan Apache, Mohawk to name a few). This dismissal not just shows the colonial attitude that both reformist activists and politicians have, but also the settler privilege that they evoke when constructing border policies. We need to be asking the why in all this? Immigration Reform to us, means militarization of our homelands, so we dare to ask the politicians and reformist activists, how can reform for many, be at the expense of the original inhabitants of the land? We need to see it for what it is, and question neo-liberal projects, such as NAFTA, not just put a bandage on policies that affect everybody! We must challenge both the politicians and reformist activists that try to pit indigenous and migrant communities against each other in their “political” solutions! We are in this together, and must start at the root of the problem, in this case from an O'odham perspective. We want to express as young O'odham, that we oppose the building and structure of a wall along the traditional O'odham territory, The concerns of the villages grow in fear of the on-going tactics that is plainly disguised as a 'part of the rules of conduct for testing censors and technology', have now made the Tohono O'odham people walking targets and criminals in the eyes of the Department of Homeland Security (DHS) in our own homelands. As O'odham people, we face the ever growing crucial attacks on Homes, traditional routes, and Identity as indigenous people. The O'odham voice still goes underminded by tribal government and the right of passage through our routes have become a killing field and a battle ground. Department of Homeland Security (DHS) recent, unprecedented power to waive existing law along the borders of the United States to construct a massive Border Wall and implementations of stricter border crossing regulations, undermines the Tribal Sovereignty, Indigenous Autonomy and Self-Determination of the many indigenous nations whose ancestral lands span into Mexico and Canada. The O'odham people, particularly the Tohono O'odham people, of southern Arizona are one such indigenous nation once again caught in the middle of the United States Border Policies. 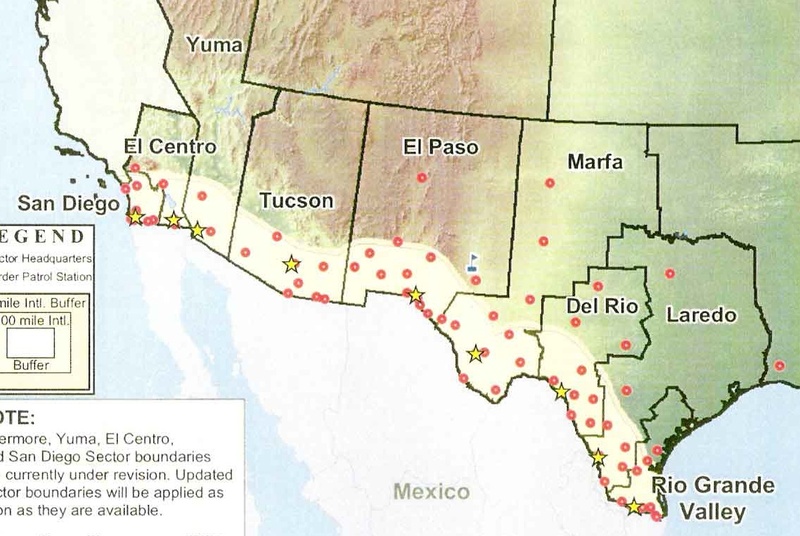 Policies that have disregarded the history, voice and cultural impacts that any border wall will bring to all indigenous people whose homeland will be further disconnected by the U.S. push to establish the 1,951 mile barrier on the U.S./Mexican Border, 75 miles of which rest on Tohono O'odham Nation southern boundary. 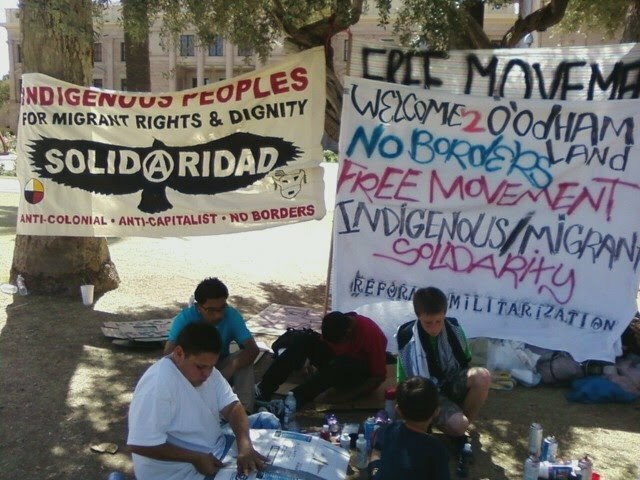 In my introductory analysis, I feel the need to state the history and connection the O'odham people have with their ancestral lands, Homeland Security's waiver power on the border and stricter policies and how such power has lead to the militarization of O'odham Jev'ed (O'odham lands). DHS power to waive existing laws to ensure the border wall will have negative implications on all Indigenous Nations whose land is separated by the U.S./Mexican Border and represents the continuation, of the colonization of Indigenous people and land in the 21st Century. The O'odham people have called what is now Southern Arizona (U.S.) and Northern Sonora (Mexico) home long before any lines were drawn on their traditional territory. 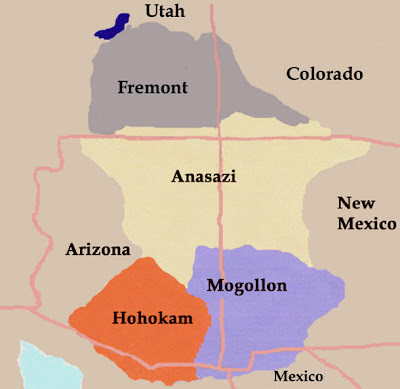 The O'odham people and their culture have flourished in the heat of Sonoran Desert for hundreds and thousands of years and their ancestors the Huhugahm (also know as the Hohokam) created a highly complex society like the Anasazi to the north and the Mogollon to the east. The massive canals that the Huhughm constructed are being utilized by Salt River Project (SRP) today and their influence is found throughout this region. O'odham culture is deeply rooted throughout this area, which is as far north as the Phoenix Valley, as far west as the coast of Mexico in what is now Rocky Point, east as the San Pedro river and as far south as Hermosillo and the Sierra Madres Mountains. In this area, the many different tribes of O'odham learned to live with the harsh heat of the Sonoran Desert. In pre-Columbus times, the O'odham never considered themselves as one “O'odham Nation”, but were centered in local, regional autonomy. But certain areas did have common traits that made them more distinguished. The O'odham who lived in the area of the Gila River and Salt River, are known as the Akimel O'odham (People of the River), for the O'odham south of this area, they are known as the Tohono O'odham (People of the Desert), and for the O'odham who live west of them, along the coast line, they are known as the Hia-Ced O'odham (People of the Sand). Each different tribe had its own unique connection and history with the regions that they lived in, but all shared a common way of life, traditions and language. Prior to European contact, the different tribes communicated and traded with each other. Each band of O'odham was familiar with each other and would come together for numerous reasons (i.e. Religious, farming, war, etc.). The O'odham would freely travel throughout their traditional lands and were unaware of the events that were happening south of them in Central Mexico with the arrival of the Spanish. The Spanish crossed O'odham land in the mid 1500's. The Spanish Conquistadors were in search of gold, but did not find any riches on their travels throughout what is now the southwest of the United States. But their travels did usher in Spanish missionaries who wanted to bring “god and civilization” to the Indians. Catholic Missionaries established missions throughout traditional Tohono O'odham lands. The missions were part of the Spanish's “soft power” tactics to colonize the O'odham to Spanish Culture. Tactics that would be that of hard labor, indoctrination of Catholic beliefs and regulation to areas in closed proximity of the missions. Contrary to most O'odham historians though, this “soft power” was not effective and only lured few O'odham to the Spanish way of life. But the Spanish misinterpretations of O'odham seasonal movement, which is mostly cited by historians as acceptance to Spanish Culture, is questionable when looked into more closely. The Spanish took advantage to seasonal migrations to wetter areas, areas for example being the San Xaiver Mission or Magdalena. The O'odham move to wetter areas was interpreted as a acceptance to the Spanish way of life but for the most part, a great number of Tohono O'odham rejected the harsh practices of the Spanish, and in many cases rebelled. In 1695, 1751, 1756 and 1776, major rebellions occurred, in which the Tohono O'odham expelled the Spanish entirely and in most cases, burned their missions down. In some instances, the O'odham would form alliances with the Apaches in the east which is interesting being that for most part, the two were enemies. These rebellions were just as large and effective as the Pueblo Rebellions going on at the same time. These rebellions temporarily expelled the Spanish Military from O'odham lands and prevented the Spanish from gaining a tight hold in the region which lead to their missions not being built any farther north than what is now Tucson and kept Akimel O'odham lands free of any permanent Spanish presence. After the Spanish lost its hold in the Americas with Mexico establishing its independence in 1821, the Mexican government would impose its colonial control over the O'odham. The newly founded Mexican government interaction was few compared to the Spanish. The more secular Mexican Government did not continue the Missionary system and shut down the last one in 1842. 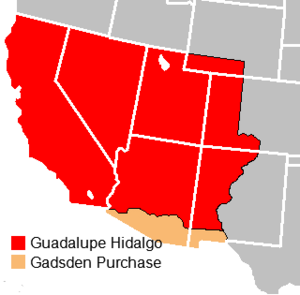 In 1846, the Mexican-American War started over territorial expansion, which leads to the Treaty of Guadalupe Hidalgo in 1848. This placed the U.S./Mexican border at Gila River but this border was still being negotiated by both governments. The Akimel O'odham and Tohono O'ohdam were never consulted in these negotiations and were not of any importance in the colonial governments decision to where the international border would be drawn. Soon after this border was expanded to where it is today by Colonel James Gadsden who negotiated on behalf of the U.S., by purchasing it for 10 million dollars. This purchase, known as the Gadsden Purchase, placed the international line through the center of traditional Tohono O'odham land. The O'odham were also not consulted and are not even mention within the purchase. The colonial attitude of Manifest Destiny was in full effect and embodied by James Gadsden, whose previous interaction with Indigenous people was his campaign of removal of the Seminoles. Gadsden previous history before becoming the Minster of Mexico was that of the railroad business, which at the time held enormous power in U.S. Politics. One of the main reasons the U.S. purchased the land was to make way for the transcontinental railroad, a point I like to state because it shows the U.S.'s total disregard to the many people that this border would impact then, but only seen the economic impacts it would bring. Basically the border was established to ensure capital, a similarity that will continue in the decades to come. The O'odham, unaware of the decisions that were being made by Washington, continue their way of life relatively unaffected by the establishment of the southern border for the rest of the 1800's. They still traveled freely back and forth between the border for traditional ceremonies and to see family. 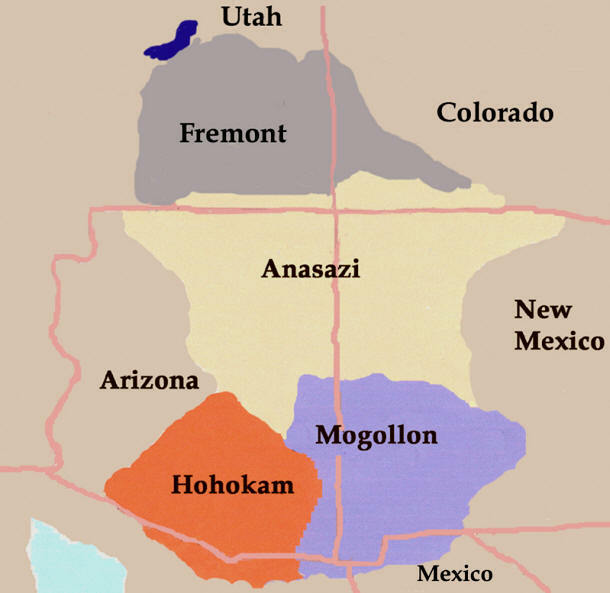 The O'odham were slow to learn that the United States now claimed hold to their land north of the border. In the years after the Civil War, more Anglo-American citizens enter traditional O'odham lands. From this point, the O'odham faced the same racist attitudes and injustices that other indigenous people faced with the U.S. Government and its citizens up to the present (land loss, persecution of traditional religion, boarding schools, assimilation policies, establishment of BIA imposed tribal governments to name a few). For the O'odham that now resided on the U.S. Side, the loss of land was intermediate. Reservations were established, and for the first time in their history, permanent borders and diversions were established around them to make way for the many Anglo-American that were now settling their lands. The Akimel O'odham were placed in two reservations, the Salt River Pima-Maricopa Indian Community and the Gila River Indian Community. 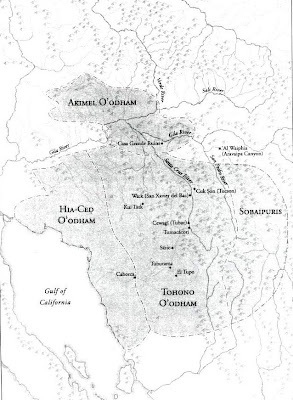 The Tohono O'odhams were bunched in the Papago Reservation (which in 1984 changed to the Tohono O'odham Nation). Ak-Chin Indian Community was established for the Tohono O'odham and Akimel O'odham who lived together by their traditional boundaries. The Tohono O'odham in Mexico have no reservation and fend for themselves, from Mexican settlers to this day and the Hia-ched O'odham whose land was mostly in Mexico, lost all of their land on both sides and have no title to their lands like their O'odham relatives in the north. The colonization of O'odham lands impacted the O'odham people's connection to the different bands of the O'odham such as the Akimel O'odham's relationship to their relatives in the south. But for the Tohono O'odham, the international line did not cut their ties to the land. Enforcement of the border was few, and pillars of the line did not mark the land as they do now. 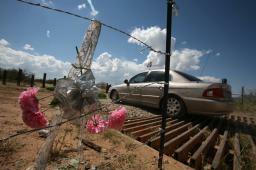 Besides chicken wire barriers to stop cattle crossing, there were no signs of any border. The establishment of the U.S. Border Patrol in 1924 did not affect them at all. Religious practices that take place on both sides of the border still took place such as the pilgrimage to Ma:lina (Magdalena). The O'odham in Mexico would still travel to the U.S. side for medical needs in the tribal capital of Sells, to buy goods and to see family. 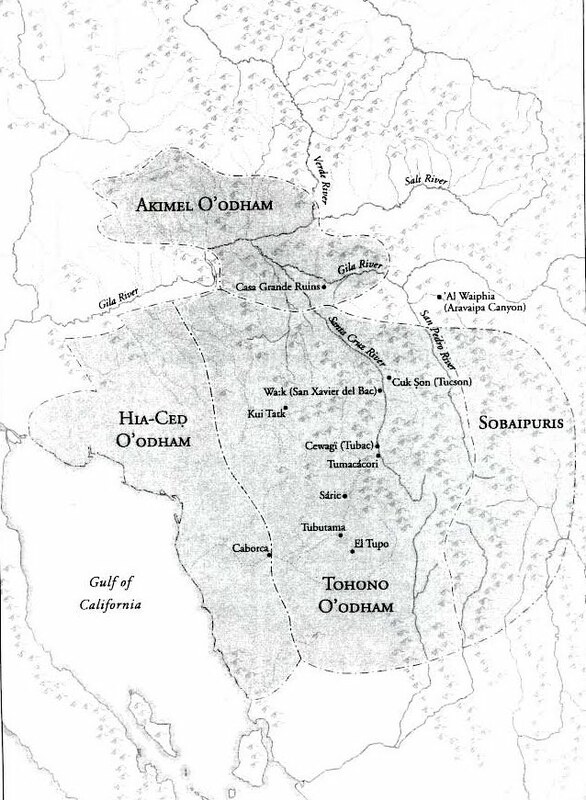 The O'odham in the U.S. crossed southwards to do the same as well. The Tohono O'odham up to this point did not have any problems with their rights as indigenous people to cross the border. The Tohono O'odham faced the many assaults on their land, and negative impacts that colonization imposed on their culture, that indigenous people around the world also faced. This colonization process did lead to the O'odham settlements in Mexico to be reduced from 45, to 9 and lead to a limitation of traditional crossings to be recognized by the U.S. Only till the mid 1990's with Immigration becoming a issue for most of America did the O'odham begin to see their inherit rights attacked by the still, colonial government of the United States. In this time, border polices were being formulated once again without their O'odham input. Clinton era policies such as Operation Gatekeeper in San Diego, CA, Operation Hold the Line in El Paso, TX and Operation Safeguard in Nogales, AZ were conducted by the U.S. Border Patrol. The aim of these operations was to crack down on illegal crossing through major cities and force migrants to go through the more barren lands along the border, one such area being the 75 mile region of the Tohono O'odham Nation lands. Another policy change was the Border Patrol now shifted its attention away from interior approach and now focused on the Border itself. 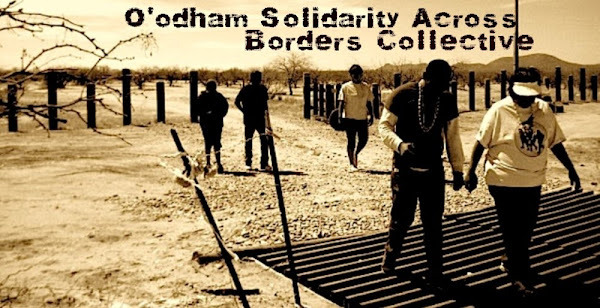 With the influx of migrants now crossing the Tohono O'odham Nation lands, the Tohono O'odham tribal enrolled members slowly felt the impact of Border Patrol Agents entering their lands. But just as previous Border Policies, the O'odham people were never considered and consulted. Congress mandated that Border Patrol secure the borders and enabled their jurisdiction to override local, state and tribal jurisdiction. Agents would now patrol the sovereign nation of Tohono O'odham, with or without the permission from the Tohono O'odham Nation tribal government (TON). I like to note, TON is the BIA recognized governing body of the Tohono O'odham people, that was established by the Indian Recognition Act of 1934 (IRA). Since its conception, the legitimacy of this body has been called into question by the the traditional people of the community. Many Traditional O'odham and parts of the community feel that TON decisions do not speak for the community as a whole. Congresses border mandates would now reflect such disconnect with TON and “its” members. TON lack of effort to enforce sovereignty, or realization that they don't really have any sovereign rights under IRA would would soon come to light with the O'odham peoples struggle to maintain autonomy in its everyday affairs. The split between TON and the traditional O'odham is not new, but would sadly play out in the struggles to come. True sovereignty over Tohono O'odham lands would not allow the many negative policies to come. But regardless of sovereignty, or lack of it, Congresses approvals of evaluated enforcement greatly attacked the Tohono O'odham people's autonomy of free movement and right to culture. Indigenous people along the border were feeling the effects of Congress's Plenary Power to impose its jurisdiction over their BIA tribal nation government and their inherit autonomy of as indigenous people. Accounts of Border Patrol harassment started to be voiced and citizenship issues brought to life. Large numbers of the TON enrolled members were not born in hospitals and did not have valid birth certificates, if any. This confusion lead to the TON issuing Tribal ID cards to the 25,000 Tohono O'odham in the U.S. and to the estimated 2,000 in Mexico. This tribal ID acted as their passport. Their Akimel O'odham relatives also utilized their tribal ID as a passport. But the wave of migrants crossing through reservation land grew throughout the late 90's and early 2000's lead more Border Agents to enter Tohono O'odham lands. Also, along with migrates crossing reservation land, established and dangerous Human and Drug smuggling rings beginning to utilize traditional crossing along the border. Border Agents were not well trained about the O'odham people and their culture, which lead to many accounts of racial profiling and human rights violations when crossing on their reservation or when crossing the borders as they did before, to see family and participate in traditional gatherings. In wake of 9/11, the United States push to secure the borders greatly evaluated more so than any time previously mentioned. At this time, Border Patrol was moved to the newly established Department of Homeland Secretary (DHS). Under DHS, the TON would soon feel Congresses Plenary Power, imposed on them all in the name of national security. 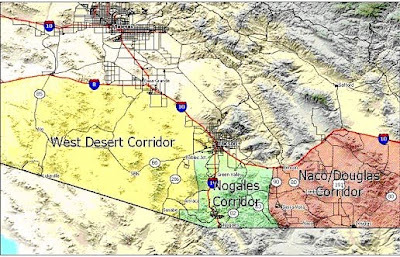 The Tohono O'odham would now face more harassment when crossing back and forth between the border, by the need to secure the border from “terrorists” and “illegal immigrants”. The TON, under pressure from DHS , partnered with Border Patrol to slow down the amount of illegal immigration activity to much dismay from the Tohono O'odham people. Tribal Governments decision to support alternative strategies to the wall, such as the construction of vehicle barriers, checkpoints and integrated camera-radar systems open the door for the Federal Government to undermine Tribal Sovereignty and attack the people's autonomy to exist as O'odham. The TON's willingness to work with DHS was desired by TON, hoping that such cooperation would prevent any Border Wall to be constructed on their lands. But just as their history shows, the concerns of the O'odham would not be heard and appeared to be ignored by the United States to established “its” border. Even though the TON decided to “work” with the Federal Government on the “Border Issue”, the TON publicly denounced a physical wall to cross their ancestral lands. But the aftermath of 9/11 would now put TON sovereign rights to not allow any wall, secondary to the bigger national emergency. The fear of another 9/11 gave the Federal Government an excuse to invade Indigenous land under the guise of security, and with the flux of immigration growing, along with huge anti-immigrant sentiment growing throughout the country, the O'odham voice would be marginalized out of the debate. The REAL ID Act of 2005 and the Secure the Fence Act of 2006 would reflect the marginalization of that voice because these acts implemented many security related mandates, one being the securing of the U.S. Borders with a physical wall. This display of Plenary Power and the executive branches mechanism to apply it (DHS) would give the Federal Government the excuse to now invade Indigenous land all in the name of national security. It’s interesting to note, that the REAL ID Act and the Secure the Fence Act were passed without the TON and the many other Border tribes being consulted by Congress. This lack of consideration follows in stride with this country's lack of regard for Indigenous peoples who have never been consulted since the border was “created” on their lands. Regardless of the obvious colonial nature, these Acts gave DHS the authority to waive all pre-existing laws under Section 102 of the REAL ID act, along the northern and southern border to implement the Secure the Fence Act. This clause gave DHS the power to “legally” acquire land from private owners, State and Federal Parks and tribal nations whose land rested on the border. This act was immediately attacked and on October 8th, 2007 not by any tribal government, but by the environmental organization, Defenders of Wildlife, who sued to stop the border wall from being built in the San Pedro Riparian National Conservation Area (SPRNCA) in Arizona, until environmental impacts studies were completed as required by the National Environmental Policy Act of 1969 (NEPA). On October 10th 2007, the Federal Court motioned a temporary restraining order to halt DHS from any construction. But on October 26, 2007, DHS Secretary Michael Chertoff waived NEPA and nineteen other laws to begin construction in SPRNCA. Secretary Chertoff put Section 102 of the REAL ID into effect, and cited that as his authority to begin construction. Soon after, Defenders of Wildlife and Sierra Club filed a complaint in the District Court of the District of Colombia. They claimed that the Secretary and DHS act was unconstitutional because of his power to pick and choose what laws to follow in construction of the border wall. This was soon dismissed by the District Court in December 2007 and which lead the plaintiffs to file a Writ of Certiorari petition to the Supreme Court. In this petition, more plaintiffs joined the suit, one being the TON. Unfortunately, this petition was dismissed in June 2008 and the lower courts decision to allow Secretary Chertoff and DHS the right to waive all statutes was now the law of the land. In the Writ of Certiorari petition, T.O. Nation did cite that DHS power to waive The Native American Graves Protection and Repatriation Act (NAGPRA), The American Indian Religious Freedom Act and The Eagle Protection Act would greatly have negative impacts on O'odham Culture and undermine their sovereignty of TON. Unfortunately, Congress's prior legislated commitment to protect Indigenous people in this country took backseat to the need to secure the border in the wake of 9/11. In the petition, other non-indigenous citizens all along the border also addressed their concerns and cited the injustice that DHS authority would bring to their communities. The displacement that DHS would cause with the construction of any border barrier is huge, but the precedent that enables them to do so is even huger. The parties that joined the Defender of Wildlife suit understood the implications that would come if the lower court decision was not reversed. But for the Tohono O'odham people, it showed the U.S. continuation of colonial polices. The outcome of the SPRNCA decision did not affect O'odham lands, but as their concerns in this suit addressed, it open the door for DHS to invade their land because as the petition was in the judicial system, DHS was already applying its power to the border region on TON and traditional O'odham lands. Those Who Are Gone..the Huhugham. In the time that Writ of Certiorari was working its way in the court system, DHS used their waiver power on traditional Hia-Ched O'odham land, that now lies in Barry M. Goldwater Range to start border wall construction, and to expand the he El Camino de Diablo, a recreational off-vehicle route. Their Subcontractor, Boeing Company did not need to perform archaeological surveys, which lead to two known Huhugham sites to be damaged and unearthed. These account for the eleven identified Huhugham sites that lie in the path of the border wall, on or off the reservation. Since NAGPRA can be waived, the proper care of these sites is not maintained. Many in the community voice their concern of such abuse of power may lead to Huhugham and O'odham remains to be funneled outside the community. The remains unearth by Boeing were later returned to tribal members, but the absolute disregard by DHS to enact their waiver powers to dismiss NAGPRA shows the impacts that any future use would cause. The physical wall would just be one attack on O'odham people and land but the impacts to “those who have gone” would bring catastrophic damage to the O'odham universe. TON initial “cooperation” with DHS to establish vehicle barriers, checkpoints and integrated camera-radar systems on their lands has lead to a escalation in these measures. Border Checkpoints have now become permanent, and become a point of surveillance where O'odham of any tribal government affiliation are harassed. In many cases, Border Agents violate traditional items in search/seize procedures. Surveillance technology, such as radio towers have been constructed on and off the reservation in DHS “Virtual Wall”. 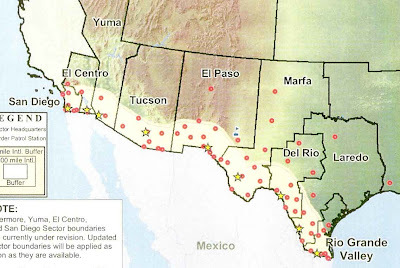 Traditional ports of entry and the immediate border area are a complete militarized zone. Along with NAGPRA and the virtual wall, the O'odham right to cross the line for traditional ceremonies became even stricter. Usually, such traditional practices of religion would be protected by The American Indian Religious Freedom Act, but since such participation spans border, O'odham were required to show proper paperwork to freely move back and forth between the border. Up to this point, Tohono O'odham people, on both sides used the tribal government ID that was issued in the mid 90's. But since that ID was also distributed to Tohono O'odham and Hia-Ched O'odham in Mexico, DHS declared the Tohono O'odham ID not able to prove citizenship, therefore not a valid ID to cross back into the United States. Along with the Tohono O'odham ID, the O'odham in the north; Gila River, Salt River and Ak-Chin tribal nations were told their tribal government ID was no longer valid. The O'odham in the north who still ventured to the south for traditional gatherings were now caught in a position where DHS only recognized the TON as a border tribe, not realizing their relatives share a connection and inherit rights just as the Tohono O'odham people do to their ancestral lands in Mexico. DHS colonial attitude labeled the O'odham not enrolled in the TON as completely different tribes. The dismissal of tribal ID's is another clear example of tribal sovereignty being infringed on by DHS, and how TON supposed sovereign rights, such as a tribal ID, can be easily waive by Congresses Plenary Powers. DHS did set a deadline, June 1st, 2009 as the date that all American citizens needed a passport and mark the last day any tribal ID would be recognized as a valid form of proof of citizenship. But the border tribes who use their tribal ID as a passport were able to extend that deadline till they can met DHS new federal requirements listed in the Western Hemisphere Travel Initiative (WHTI). In WHTI, it requires that any ID card or passport to be RFID ready. So in November 2009, TON announced that it enter into “agreement” with DHS to produce their new “enhanced” tribal ID which will be RFID ready. DHS's push to militarized our lands, and tribal government's cooperation in doing so not just shows how tribal sovereignty in the border region does not really exist, but shows how the voice and concerns of the O'odham people have been disregarded by both federally backed institutions. Regardless of how you see the immigration issue, the O'odham are stuck in policies that have been created not by them, but by the bigger ever-existing colonial system where borders are established to maintain capital flow. 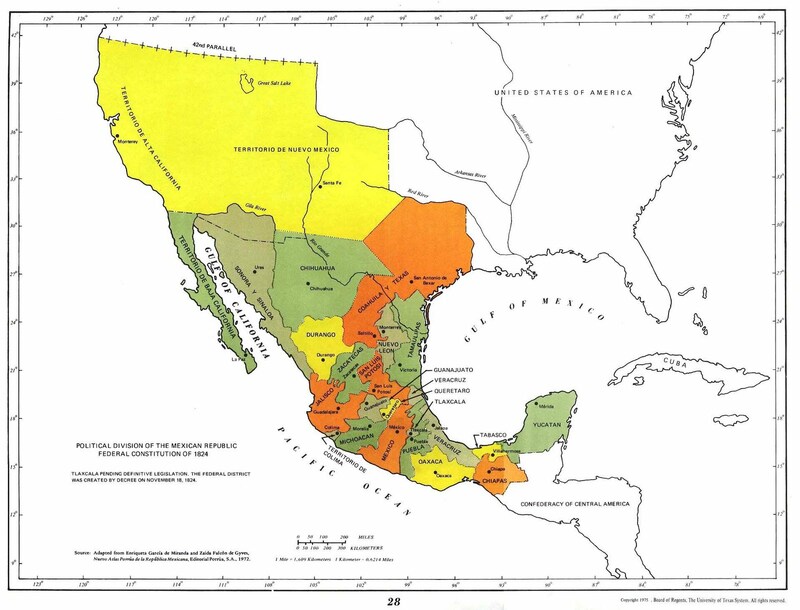 The U.S.'s objectives in its war with Mexico and James Gadsden purchase in the 1800's are no different to what the U.S. Border policies is today, to ensure capital at expense of indigenous displacement. If people were informed about the history of the border, and why it was established, it would then put today's struggle in perspective. The O'odham people are now in the shadows of the North American Free Trade Agreement (NAFTA), which leads to the bigger struggle of globalization. I feel, the basic principals of these policies and the history of its oppression to the many other indigenous nations worldwide , must be told to show the colonial nature that each embodies. The O'odham people must be informed of “why” migrants cross and “why” O'odham land is now a corridor for migration and drug smuggling . If TON took a broader approach with the immigration issue, it would not be a issue of migration, but a issue of globalization. TON is in a unique position to publicly critique these issue, but decides not to due to the colonial framework of tribal nations and the United States (ward/guardian relationship). The Defenders of Wildlife v. Chertoff case reflects the importance that the U.S. holds in their global economic agenda of globalization by justifying the Border Walls in their courts, and the expense of the displacement of all people. It shows that justice in our lands will not come from the courts because they represent the colonial power. The same arguments that the courts offered in the Marshall Trilogy that stated they have no choice to rule the way they did because the policies of the United States mandated them to do so, is just as alive today. National Security is the guise today. But for the O'odham, it has ushered in a apartheid-like tribal nation, where tribal government operates in a confined colonial system which offers only colonial solutions to the many migrants who journey to this country for survival. In conclusion, I felt the need to provide the history of the O'odham and the Border was important because it shows the continuation of colonization and puts the struggle in perspective for people who are unaware of the O'odham. In my travels, as a Tohono O'odham, I find myself meeting many who have no idea of our connection to our traditional land. This connection has long been under attacked since the days of the Spanish, and the United States endorsement of globalization policies is now attacking our O'odham Him'dag. The need to understand the Defenders of Wildlife v. Chertoff case is important because it shows the politics of the colonial rule. Politics that put the O'odham voice behind their security and capital. Militarization now is the state of my lands, and judicial system is not the answer. I wrote this to educate my fellow O'odham, and those who stand in solidarity with us, so we can construct ideas thats may, or may not work in their system. Hopefully, this understanding of the issue will lead to a bigger debate. Not just the same colonial one that is offered by them. Black Panther was a great movie. Wakanda forever! Bannerizer makes it easy for you to promote ClickBank products using banners, simply visit Bannerizer, and get the banner codes for your picked ClickBank products or use the Universal ClickBank Banner Rotator to promote all of the available ClickBank products.